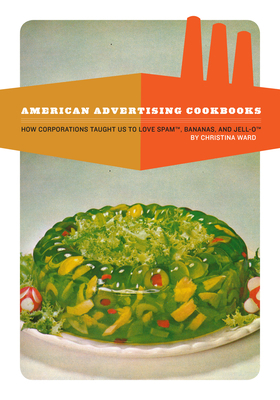 American Advertising Cookbooks: How Corporations Taught Us to Love Bananas, Spam, and Jell-O (Paperback) | Fountain Bookstore, Inc. I love micro-histories like this one about how Americans became convinced to buy and eat foods previously foreign to us (bananas) and to embrace faux-foods like SPAM and Jell-O and many more. Promotional cookbooks and advertising were aimed at introducing these new products to homemakers using tactics including showcasing new "scientifically proven" "nutrition advantages", preying on insecurities about being overweight or lower class, convenience, and many other so-called advantages. This book is a lot of fun, even if you just look at the stomach-churning pictures of Ham Wrapped Bananas in Cheese Sauce, various meat-laden Jell-O salads. It is also a shocking look at the blatant use of racist images, manipulative lies, and the international political chaos caused by the corporations pushing many of these goods and products on the American families. It's an easy read, you'll learn a lot, and will never look at your supermarket shelves the same way again. American Advertising Cookbooks: How Corporations Taught Us to Love Spam, Bananas, and Jell-O is a deeply researched and entertaining survey of twentieth century American food. Connecting cultural, social, and geopolitical aspects, author Christina Ward (Preservation: The Art & Science of Canning, Fermentation, and Dehydration, Process 2017) uses her expertise to tell the fascinating and often infuriating story of American culinary culture. American Advertising Cookbooks, How Corporations Taught Us To Love Bananas, Spam, and Jell&ndashO features full-color images and essays uncovering the origins of popular foods. Christina Ward teaches notoriously raucous preservation classes and serves as a volunteer mentor to urban farmers, small-scale food producers, and question answerer for people all over the country trying to save their pickles from disaster. Her work focuses on the history the foods we eat and the stories of the people who make that food taste good. She is a contributing writer to Serious Eats, resident food expert for Fox6 Real Milwaukee (television), and former columnist for Edible Milwaukee. She has also written for Remedy Quarterly, Put An Egg On It!, and The Milwaukee Journal Sentinel.